Chipotle Mexican Grill is set to open the second week in October in the recently-constructed building at the corner of Carson and Stewart streets at the southwest corner of the mall property, according to Gabe Hagemann, managing director, The Carrington Company, the mall’s Eureka, Calif., owner. Chipotle, a 24-year-old fast-casual food chain with more than 1,500 restaurants, will occupy 2,000 square feet in the new 5,000 square-foot building. Pacific Dental Services is leasing the remaining 3,000 square feet and plans to open the second week in November, said Hagemann. “They have 500 offices nationwide and will be a great fit out there,” he said. Both tenants are now in the building making tenant improvements, Hagemann said. A new restaurant is also opening in October in the mall’s standalone building recently vacated by Tahoe Ridge Winery. Hagemann said he couldn’t disclose the tenant yet, but that it was an independent restaurant that had been looking for space in the area. The Carrington Company is talking to potential tenants for the 23,500 square foot store last occupied by Bealls, which closed its doors in June. Hagemann said he hopes to find a single, ideal business for the space. “We are being very deliberate about that,” he said. Shaheen Beauchamp Builders LLC is working on construction of a 28,500 square foot warehouse at 3320 Research Way, south of the Maverik gas station. Jeff Shaheen, co-owner of the construction company, said a tenant has signed a lease for 18,000 square feet with 10,500 square feet still available. John Uhart Commercial Real Estate is the broker on the building. 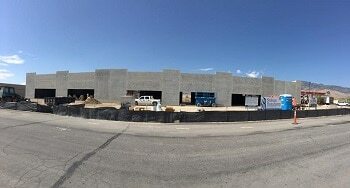 The $3.5 million building may be the first spec building built in Carson City in more than a decade, meaning it was built to be put on the market and not under contract for a specific client. The Ormsby House has a few prospective buyers, according to Ted Stoever, senior vice president, Northern Nevada Land & Development Investment Services for Colliers International. Stoever said any formal offer for the property will be followed by a few months of due diligence. The Carson City Board of Supervisors approved an extension on the Ormsby House building permit in the hopes of making it more attractive to potential buyers, but the current owners, Don Lehr and Al Fiegehen, represented by Kim Fiegehen have to give the board updates every six months on the effort to sell the property. The next update is scheduled for the board’s Sept. 7 meeting.